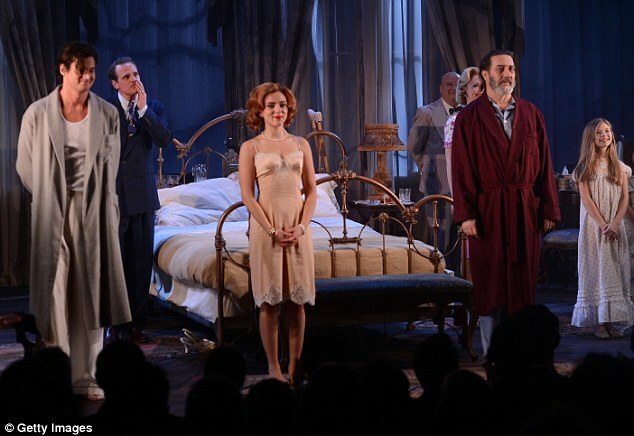 Scarlett Johansson drew overwhelmingly positive reviews from the critics for her revival of Maggie in Tennessee Williams' play Cat On A Hot Tin Roof. Scarlett, 28, had the huge task of stepping into Elizabeth Taylor's iconic role who was nominated for an Oscar for her role in the 1958 movie which starred Paul Newman. The actress celebrated the opening of Cat On A Hot Tin Roof by looking absolutely stunning as she graced the red carpet for the after-party. Scarlett donned a black ensemble consisting of fitted black trousers and a crochet button fastened top short sleeve top, allowing her tattoos to be seen. Keeping it simple she added lace print pointy toe heels on her feet for the event at The Lighthouse in New York. But the 28-year-old added a pop of colour with her beauty choices, wearing scarlet lipstick and a matching hue of nail polish. The blonde wore her hair up in a bun and fashioned green and blue drop earrings. She portrays Maggie in the Tennessee Williams play and dons a strawberry blonde wig for the part.